Did you know that you only need 1,000 French words to understand 76% of all French nonfiction writing, 79.6% of all fiction, and a whopping 87.8% of all spoken French conversations? Now you can take a shortcut to French vocabulary by learning 1,000 of the most common French words covering 26 themes - with no need for rote memorization. All you need is six to seven minutes per day to listen to audio drills. The exercises will teach you 20-25 French words each day through a repetition method designed to help you grasp the words naturally. Pronounce common French words the right way. The drills are narrated by a French speaker and guaranteed to help you learn and practice correct pronunciation - as it is spoken by native speakers today. Each word is repeated first in French with its English translation (spoken in normal speed), and one more time in French, but spoken in slower speed. Each daily session lasts for six to seven minutes and is very easy to follow. You can listen to the drills practically anywhere - in your commute, while driving, running, doing chores, or during any free time you have. The words are divided into 26 themes, making it easier for you to focus on the topics you are most interested in. I've been playing this book in my car on my way to work for the last few weeks to get more comfortable with speaking the language. I took French in high school and was great with the written and not so great with actually speaking it. This book has such a variety of words and this method is so effortless, it has improved my pronunciation a lot! 32 sur 32 personne(s) ont trouvé cet avis utile. French Audio Flashcards ranks at the top of French learning programs for me because of how convenient it was to brush up on my French vocabulary anytime and anywhere. The quizzes also lead to mastery and added confidence. I haven't had French instruction since high school and this program has put me at ease about my upcoming trip to Europe in the Spring. If you could sum up French Audio Flash Cards in three words, what would they be? 18 sur 18 personne(s) ont trouvé cet avis utile. Perfect for developing your French! This audio book is truly marvelous! It is perfect for learning and building your skills in French! After listening to the book, my brain has been able to become more familiar with French at a very fast rate. The narrator is a native speaker of French which makes it much easier to understand the pronunciation and how to speak like a true native. Not only is the audio book narrated by a native but they say a word in French first, then English, and then repeat it in French again to really help you memorize the words to the point where you no longer have to try to remember what it means but you immediately know what it means. The pacing is also very nice as it isn't too slow but not too fast, it is just right. The audio book also allows you to get work done while learning French which is a huge plus! 16 sur 16 personne(s) ont trouvé cet avis utile. I would absolutely recommend the French audiobook as supplemental learning material. I think it is an especially good method for auditory learners, because not only are you building vocabulary quickly, you are also learning pronunciation from native speakers. The audiobook is designed for you to listen and learn passively, so it is very convenient. I was able to listen to the audiobook while I completed other tasks, and it was still easy to remember most of the words. I especially liked that there was a mix of individual words and short phrases. 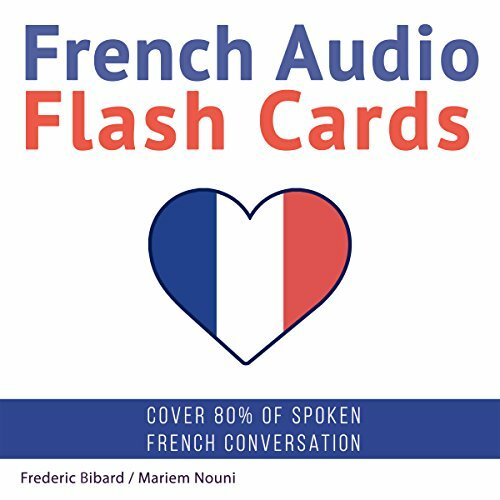 Where does French Audio Flash Cards rank among all the audiobooks you’ve listened to so far? I really enjoyed this method. Spanish vocabulary is something complicated to memorize. I start to build reflexes and my spanish pronunciation has been improved. I am much more comfortable speaking now that my vocabulary come to me more quickly and naturally. The drills give you practice in random order and that has been enormously helpful. Great product. This is a wonderful two-in-in one resource. The audio materials are perfect for a busy or on-the-go learner since they are well-suited for multitasking (listening while running, walking, doing chores, etc.). I have found them helpful for both practicing accurate pronunciation and remembering the gender of words, two things that can easily fall away for people without the time to enroll in a formal class. Meanwhile the accompanying PDF serves as a fantastic reference document that you can look to at any time for suggestions on how to raise the level of expression in your speaking or writing. I would definitely recommend this for anyone trying to keep up with French on their own. This French Audiobook is absolutely amazing. I love it! It has a nice friendly voice and all of the French word or sentence is spoken by a native speaker which you can easily understand. I've been playing this audiobook while having my workout. It is so easy and very effective and not even complicated to memorize. My pronunciation of each word has been improved. I highly recommend this product to everyone who want's to learn French. I have completed my French Audio Flash Cards. And did learn the basic words and so as the advanced. I really enjoyed the product and it help me build more confidence in speaking the language. I highly recommend this product. Great method! This audiobook really helped me to improve my French. It is useful because French pronunciation is the one you need to hear to memorize. This method is also great if you want to be able to learn language everywhere. You can listen to it on the car or at home. I think this book covers all important topics that you need to know if you want to learn French fast. I'll definitely recommend this audiobook to my friends! I had interest in the French language for a long time. I am lucky to find this audio book. The method is good for people who don't have time to visit language courses. Also, I can listen to it on the go and on the car, which makes this audio-book the handiest. I would recommend this audio book for people who are interested in learning this beautiful language. PS: It also provides PDF file with guidelines and content of the book. So to say I would recommend it! Great book.